Gold Medal, Gold Medal Wondra, and Signature Kitchens flour recalled due to possible E. coli contamination. NEW YORK (KTRK) -- General Mills is recalling about 10 million pounds of its flour over a possible link to an E. coli outbreak in 20 states. 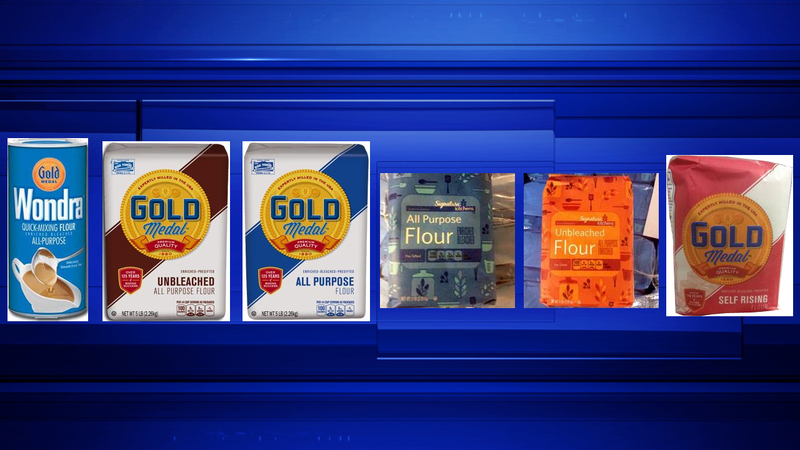 The recall is for several varieties of Gold Medal and Signature Kitchens flour that were sold at Safeway, Albertsons and other supermarkets. General Mills said E. coli hasn't been found in any of its flour products, but is still recalling them out of "an abundance of caution." The company said Tuesday 38 people were sickened from mid-December through May 3. The Centers for Disease Control and Prevention found that half of the people used flour before getting sick, some of which was a General Mills Inc. brand. Some may have also eaten raw dough or batter, the Minneapolis food company said. General Mills said customers should not eat raw dough or batter, and the bacteria found in raw flour is eliminated when cooked. It also said customers should wash their hands and work surfaces after contact with raw dough or flour. The strain of E. coli that may be linked to flour can cause bloody diarrhea and dehydration, the company said.